TRYCW asked Cheech Marin who would play him in a movie and asked about Tommy Chong's cancer treatment. The 1970 Plymouth 'Cuda Convertible from the Cheech Marin/Don Johnson show, Nash Bridges is for auction on ebay. 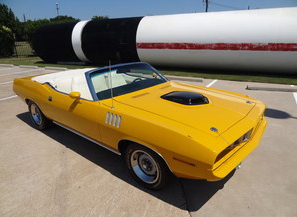 Texas Classic Cars of Dallas is proud to present this famous 'Cuda convertible. This car is known as Nash Bridges #1, used in the filming of the Nash Bridges television series starring Don Johnson. Four cars were produced for the series. This car is actually the lone real Cuda of the group and the 1st acquired for filming. The other cars were 318s. From the factory, this car was one of approximately 85 4-speed 340 convertible Cuda's produced in 1970.
" Nash Bridges # 1 Filming Car "
" Frank Bennetti, movieland car czar, was recruited by Don Johnson to acquire four matching Curious Yellow Cuda convertibles. Bennetti's frantic seach for 'Cuda convertibles was on . He found the first car (VIN: BS27H0B163146) in the Los Angeles area the next day. It was a decent restoration of a 1970 'Cuda 340 automatic. The owner had converted it from a four-speed, and had kept all the parts needed to restore it back to manual shift. Bennetti's team pulled the 340 engine and replaced it with a warmed-over 360. When the four-speed was installed, a Lakewood scattershield was fitted at Don Johnson's personal request. Other modifications include the installation of a '71 front clip replete with a Shaker hood scoop. This car turned out to be Johnson's favorite of the group and was not to be used for jumps. But, in the first episode of the fall '96 season, this 'Cuda rocketed through a San Francisco intersection at low altitude and upon landing, the front end collapsed. The front end was then rebuilt with a heavy duty K member with heavy duty torsion bars, and more. This car has a rubber front bumper, whereas the other cars are painted steel. " Bidding is at 88k so far, but the reserve hasn't been met. On the occasion of Paramount Pictures' 100th Anniversary in 2012, the famed Hollywood studio, lead by Chairman and CEO Brad Grey, gathered over 100 of the world's biggest stars to participate in a historic photo in celebration of the studio's illustrious past and bright future. The photo includes J.J. Abrams, Antonio Banderas, Jennifer Beals, Jamie Bell, Justin Bieber, Bird Brad, Jack Black, Peter Bogdanovich, Ernest Brognine, Josh Brolin, James Caan, Dana Carvey, David Chase, Don Cheadle, John Cho, Tommy Chong, George Clooney, Glenn Close, Sacha Baron Cohen, Bud Cort, Kevin Costner, Tom Cruise, Jon Cryer, Jamie Lee Curtis, Claire Danes, Philippe Dauman, Robert De Niro, Bruce Dern, Cameron Diaz, Leonardo DiCaprio, Kirk Douglas, Robert Downey Jr., Robert Evans, Dakota Fanning, Elle Fanning, Jon Favreau, Katie Featherston, David Fincher, Frances Fisher, Jane Fonda, Harrison Ford, Megan Fox, Morgan Freeman, Andy Garcia, Richard Gere, Tyrese Gibson, Scott Glenn, Alejandro Inarritu Gonzalez, Bruce Greendoow, Brad Grey, Melanie Griffith, Davis Guggenheum, Ed Harris, Amy Heckerling, Emile Hirsch, Dustin Hoffman, Julianne Hough, Kate Hudson, Rosie Huntington-Whiteley, Felicity Jones, Anna Kendrick, Sir Ben Kingsley, Johnny Knoxville, Shia LaBeouf, John Landis, Jerry Lewis, Christopher Lloyd, David Lynch, Ali MacGraw, Shirley MacLaine, Garry Marshall, Marlee Matlin, Demi Moore, Julianne Moore, Eddie Murphy, Olivia Newton-John, Jack Nicholxon, Nicke Nolte, Ryan O'Neal, Patton Oswalt, Paila Patton, Simon Pegg, Sean Penn, Chris Pine, Brad Pitt, Natalie Portman, Zachary Quinto, Sumner Redstone, Ivan Reitman, Jason Reitman, Molly Ringwald, Chris Rock, Mickey Rooney, Paul Rudd, Eva Marie Saint, Zoe Saldana, Adam Sandler, Martin Scorsese, Tony Scott, William Shatner, Steven Spielberg, Patrick Stewart, Oliver Stone, Meryl Steep, Barbra Streisand, George Takei, Charlize Theron, Billy Bob Thornton, John Travolta, Karl Urban, Gore Verbinski, Mark Wahlberg, Mike White, Billy Dee Williams, Anton Yelchin, and Michael York. Richard Cheech Marin is about to receive an award, not for twice being an allegedly very bad husband, but for spending a lot of his money on Chicano art. On July 14th, Cheech will be receiving the Arts Patron of the Year Award at upscale art fair ArtHamptons, and he’s curating Thomas Paul Gallery’s booth for the fair. He’ll also host a “Cheech’s Birthday Bash,” July 13, at the Polo Lounge at Nova’s Ark Project in Bridgehampton. For those of you that don't know, the Hamptons is located just outside New York City. It's where very rich people live so they can hang out with their own. Tommy Chong, who turned 74 last month, told CNN today he is battling prostate cancer. Chong says he first noticed symptoms when he was incarcerated eight years ago for conspiracy to distribute drug paraphernalia. He was officially diagnosed approximately one month ago. It's a slow stage cancer and he's treating it with hemp oil. He stopped smoking pot one year ago and instead takes hemp oil before bed to treat the cancer. He didn't say if he's also treating it with Western medicine. Keep in mind that this was an interview with CNN's Don Lemon about legalization. 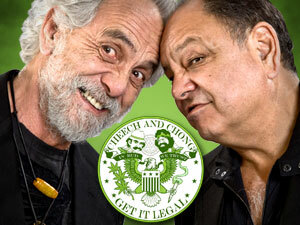 Cheech and Chong are bringing their Get It Legal tour to Joliet, Illinois. When? October 27th Where? Rialto Square Theatre Tickets go on sale Wednesday, June 13th at 10am local time via the Ticketmaster link above.